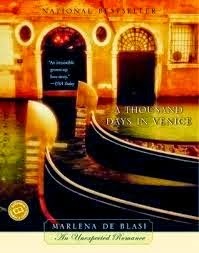 Our current selection for Cook the Books Club is A Thousand Days in Venice by Marlena de Blasi. What a delicious co-mingling of romance, tempting food and place - Venice, of course! My own stay in La Serenissima a few years ago was all too short. An American food writer and chef, Marlena is traveling in Italy with two friends when she meets "The Stranger", a Venetian Peter Sellers look-alike, whose shy pursuit ends up enchanting her. There was much to inspire our cooking, from pastries to Wild Mushrooms Braised in Late-Harvest Wine. Fabulous food she encounters in Venice, dishes created with local produce, and meals dreamt up and served with passion and imagination. Hard to choose. 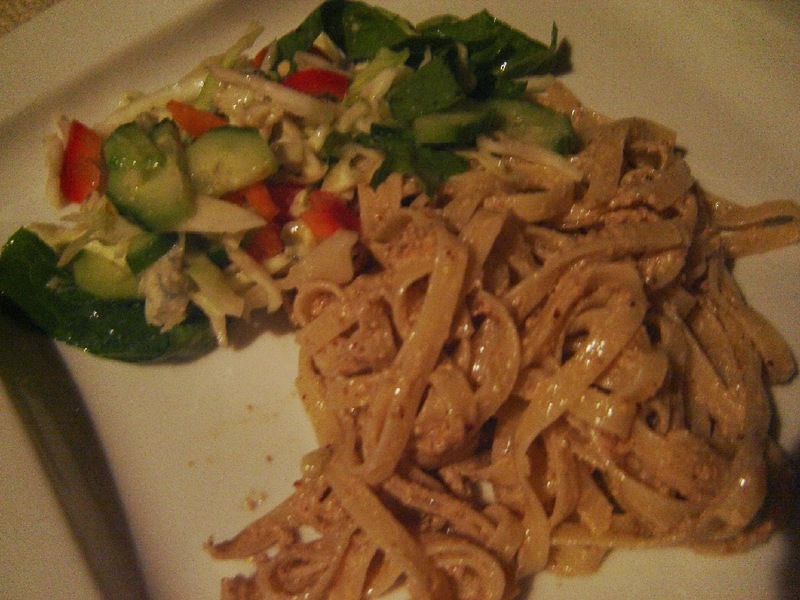 However, in the end it was the Pasta with Roasted Walnut Sauce that grabbed me. 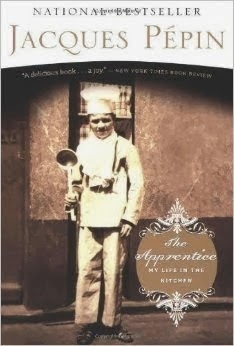 As Jenni quotes Julia Child, from Mastering the Art of French Cooking: “Sauces are the splendor and glory of cooking, yet there is nothing serious or mysterious about making them. These are indispensable to the home cook”. Well, I've been making all sorts of sauces for a great many years, being the old lady that I am, so the real job was to find the untried, the tasteful new horizon. I had a nice piece of ahi tuna, left from the previous night's dinner, and wanted to do something other than mash it up and make sandwiches, or slice it onto a big Salade Nicoise, (admittedly tempting in this still hot summer weather). But just enough for a dinner for two. Nicely sauced. 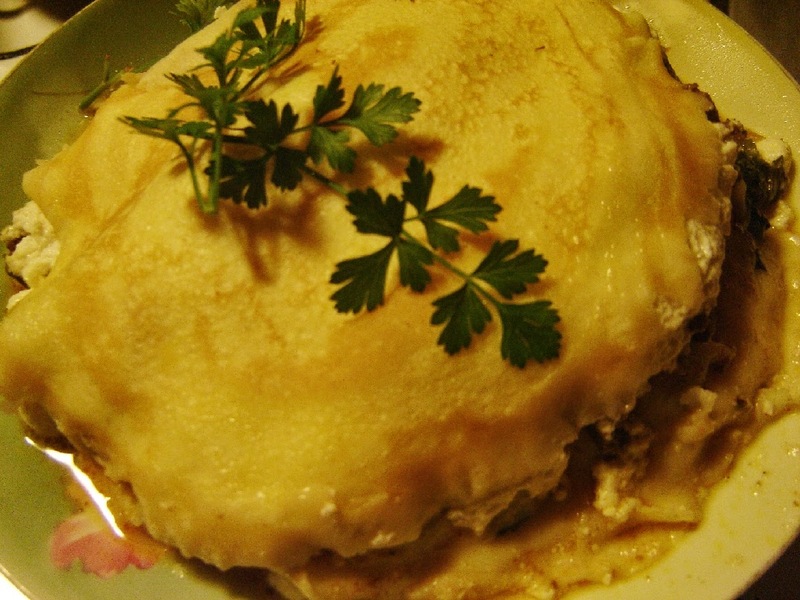 A famous French chef of the early 19th century, Antonin Carême said there were 5 classic "mother"sauces: Béchamel, Velouté, Espagnole, Hollandaise and Tomato, and from these, which were given for our challenge, listed with their various derivatives, I thought the Sauce Allemande, an off-shoot of Velouté, sounded yummy and just right for that fish. I first made a batch of stock from my hoarded freezer bag of goodies (mostly chicken bones with some carrot, onion and celery bits), strained it all, then put into the fridge to let the fat rise and harden, for lifting off. Then you might reduce your stock to concentrate the flavor. Melt the butter, add flour and then the stock and seasoning. Simmer and stir until well combined and thickened. Off the heat whisk well the egg yolk and cream and add gradually to the sauce whilst whisking. Stir the sauce until slightly thickened. Do not re-boil. 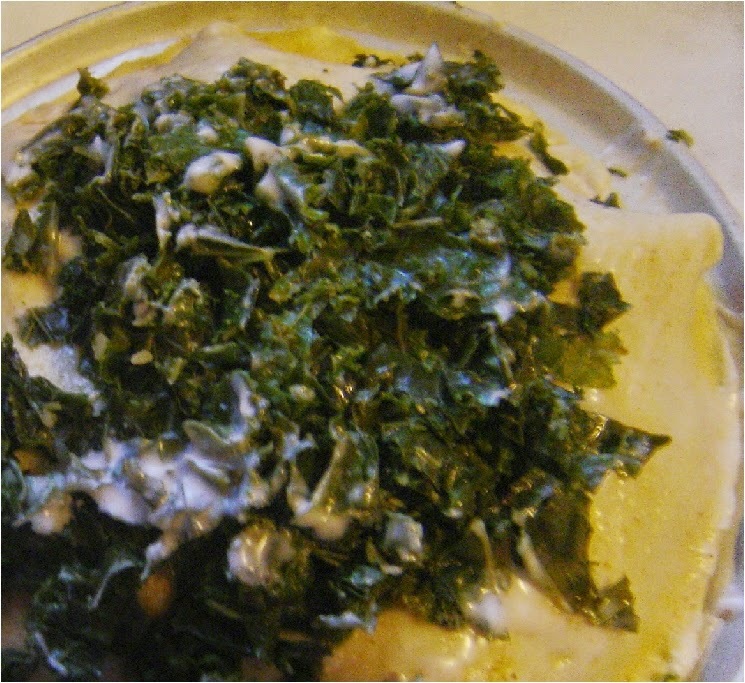 Just before serving, stir in the lemon juice, butter and capers. Made a bit more than needed, but delightful tasting, subtle delicate flavors to aid and albeit a nice piece of fish, or veal would also be good. Highly recommended. I have plans to consider for the extra sauce. And, that recipe made quite a bit of sauce. Next night report: I ladled it onto steamed new potatoes as a side with tenderloin steaks. Really, really yummy. This is being posted just to encourage you all to try, if you haven't already, a Dutch Baby, often known as Clafoutis, or just big puffy pancake with fruit of some sort on the bottom. In my case sliced green mangoes. You may also use green apples, tart plums or what have you. Part of this is a sad commentary on human nature. 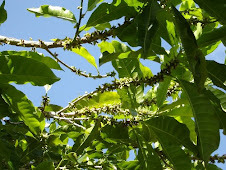 We had lots of green mangoes at our market, and when I asked where all the ripe ones were, was told, ripped off from the orchards! People steal fruit in the night. Unbelievable. Well not really, thievery being what it has always been. So we got green ones, as I had used them before in pies (just like tart green apples) as well as for Dutch Babies. Just fantastic, tartness with sweetness, the caramelized fruit in a bit of butter, topped with puffy cream puff like pancake. This breakfast treat is simplicity itself, whips up so easily, trust me, and is nicely impressive, served at once. You don't want to let it wait and deflate. 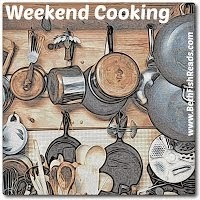 Set oven to 425 F. Melt the 2 tablespoons butter in an oven-proof skillet, add fruit and sugar. Cook and stir until slightly softened, then add remaining butter, let melt and stir. Meanwhile, put eggs into blender and run at hi speed for 1 minute, with blender still running, add milk gradually. Then slowly add the flour and continue whirling for 30 seconds more. Pour batter over fruit. Now bake until puffy and browned, about 30 minutes. That's all, enjoy! Especially nice if your sous chef has fried sausages or bacon to accompany it. Our oh so very daring Daring Cooks' challenge this month was to make Haggis. Yes, this had to be from a Scots person, and so it was, Ruth of Cakey-Makey. And, being at least half Scotch myself, it was something I had always harbored way in the back of my mind. Like what is this strange ancestral food? 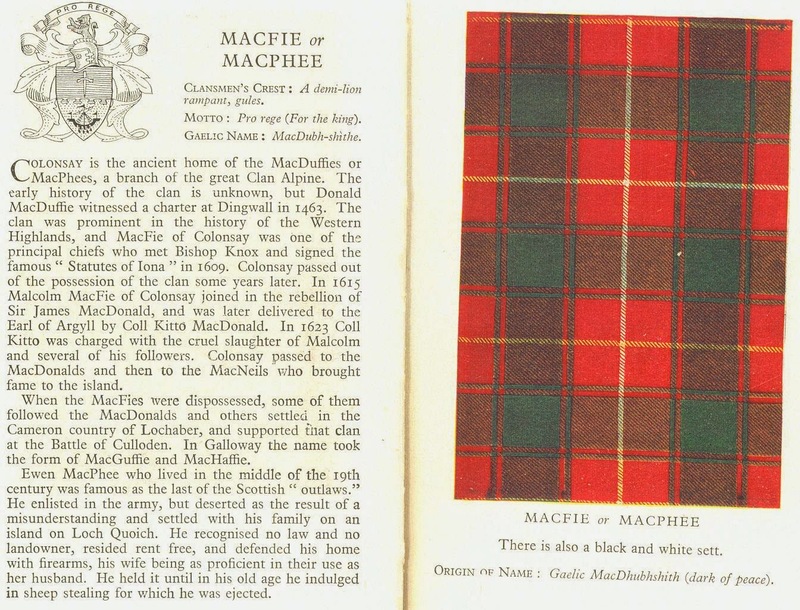 Here you can see our clan tartan. True haggis calls for using the "pluck", of a sheep or lamb, which should include the heart, the lights (aka the lungs), the liver and the stomach, which is the casing for it all. Really dears, we're just making a large sausage. Not too hard to make if you happen to know of or can find anyone butchering a sheep or lamb. 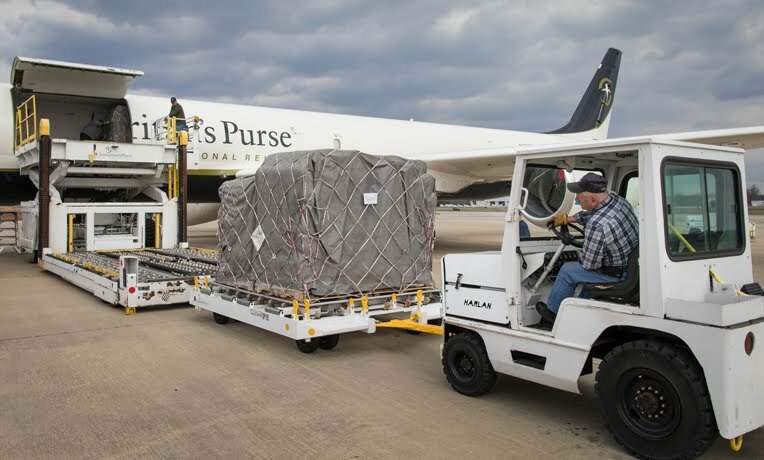 Usually they do not want the innards and will possibly off load it to you upon request. Or, at least as in my case, the friendly meat specialty person at your regular grocery might help to secure one. He had just purchased a whole lamb, and when I asked, called the grower to see if he could get the pluck as well, which had not been included. Well, when I got the bag of innards de-frosted, and a good look taken, there was some lamb's skin, some cleaned intestines, heart, and liver, but no stomach or lungs. Great, it was back to sourcing. Just for those of you interested in Scottish tradition, and food lore in general, I am giein' forth the real thing recipe here. It seems to be one of the less complicated methods around as well. Further. you might enjoy, as I did, the Guardian's pictorial by Tim Hayward, a step-by-step guide to making Haggis at home, with background info. I incorporated a few of their additions to the following recipe, i.e. rosemary, sage, thyme (could use even more of that), and beef suet for extra flavor and texture. Cook the liver, heart (trimmed) and lights in salted water to cover and cook for about 1½ hours. (Leave to cool overnight in the stock). Strain, but reserve the broth, and chop the meats up finely, or mince. 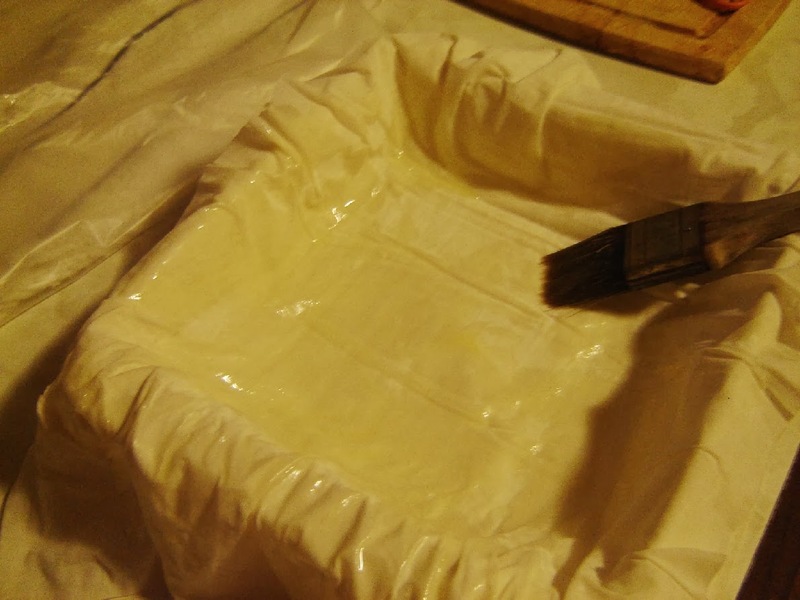 Since my stomach search narrowly missed two, I went with cheesecloth, as recommended by a local chef, who also suggested tripe, so lined the bottom and sides of my cheesecloth with that, then filled with the haggis mixture, tied it up with string, and proceeded as above. Uploaded onto a plate, and garnished with parsley, it doesn't present too badly. "I've never been to a Burns Night dinner so I've never had the full experience of the piped in pudding, the declaiming, the toasts, but having cooked a full-sized battle haggis I'm beginning to understand it. This is a genuinely monumental piece of food. There's something about the steaming, bulging shape of it, the astonishingly welcoming smell that could easily inspire ritual and poetry in a nation less emotionally constipated than the English. And the taste…. oh the taste. I can't remember ever eating anything quite so rich. The grains absorb the fats and flavors, the powerful aromas of the meat are dispersed throughout; the velvet liver is offset by a slight nutty texture - it's a comprehensive and completely astonishing sensory assault. With the combination of fat richness and slight livery aftertaste I found myself thinking of foie gras - but more fun. Am I converted? Absolutely. I was led astray by cheap ersatz haggis, by fear of guts and generations of bad jokes but now I see the light. I'm completely sold on haggis ... so string me up." Don't know that I would go so far, but did enjoy me giant haggis experience, and no one could now accuse me of being a Sassenach. There was a tremendous amount of it, so I made up some sausage patties for breakfast with eggs, and will be bringing some to a party for everyone there to have the experience. Actually the whole amount could be made into patties and frozen in separate zip lock bags. Thanks for the truly challenging challenge Ruth! Our latest project at Cook the Books Club was Funny in Farsi, A Memoir of Growing Up Iranian in America, by Firoozeh Dumas. It was indeed funny, lively and insightful as well. Moving to America at the age of 7, back in 1972, and popped right into public school, was an eye-opening experience for a small girl, especially for one who did not speak English. What she remembers from that first day - "The bathrooms were clean and the people were very, very kind." But you have to read the whole story to appreciate. 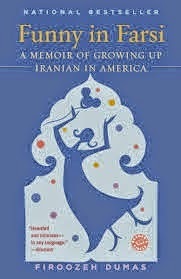 Dumas sprinkles mentions of delicious sounding Persian foods throughout her memoir, and I was tempted by many. However the lamb roast in my freezer did the final selection. That and my copy of an earlier Cook the Books Club selection: The Silk Road Gourmet by Laura Kelley. The section on Iran to be exact, with a fabulous sounding recipe for Lamb in a Pomegranate-Cardamom Sauce (Fesenjan). Oh boy. That sounded like something I'd like to try. Really, Pathiri could be considered for Passover, or Easter even, as it looks like a largish egg. And, crepes are a form of unleavened bread, right? So, greetings, whatever your celebration! This traditional savory cake is supposed to be composed of a filling layered between crepes spread with coconut cream, and the whole topped with more coconut cream before being baked. I baked mine in a small spring form pan, but you can use a small oven-proof frying pan if you have one. I decided to make the layers complementary, but vary them. 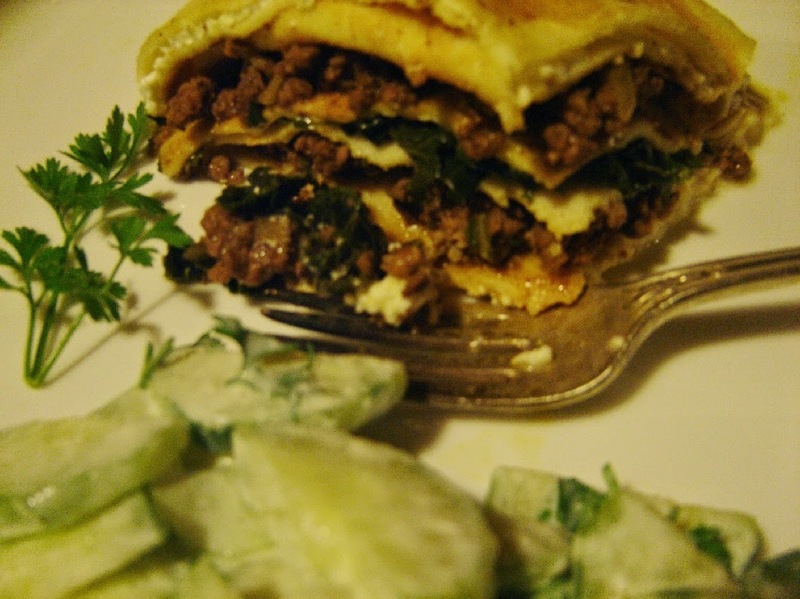 Two of a curried ground beef mixture, two layers of ricotta, and a layer of chopped steamed baby kale. But it's got all the spices, and plenty of coconut milk, spread on all the crepes, so we aren't diverging completely here. You start with getting the crepes made. 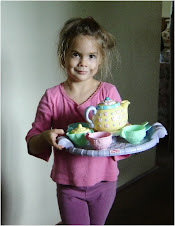 I just did my regular recipe, as they are something we love, and I make them frequently. The easiest way is to put your eggs and about half the milk in a blender, then while it's whizzing, add the flour and enough extra milk to get a good crepe batter, (should coat a wooden spoon) adding also the oil or butter. Swirl about 1/4 cup in a hot crepe pan, coated with a bit of butter if needed, and cook on both sides very briefly. Just enough to color. Next make your spicy Indian filling. 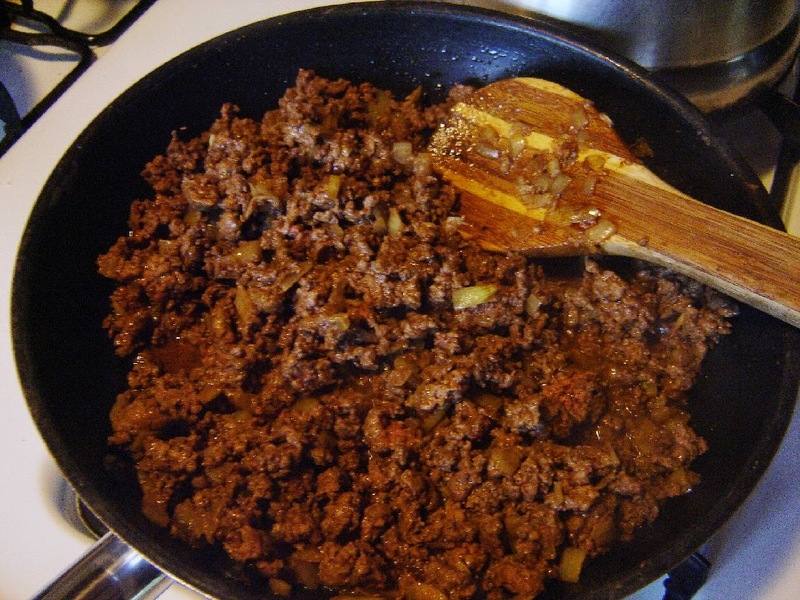 You can use chicken, (recipe given at the Daring Cooks site) ground beef or lamb, or make it vegetarian. 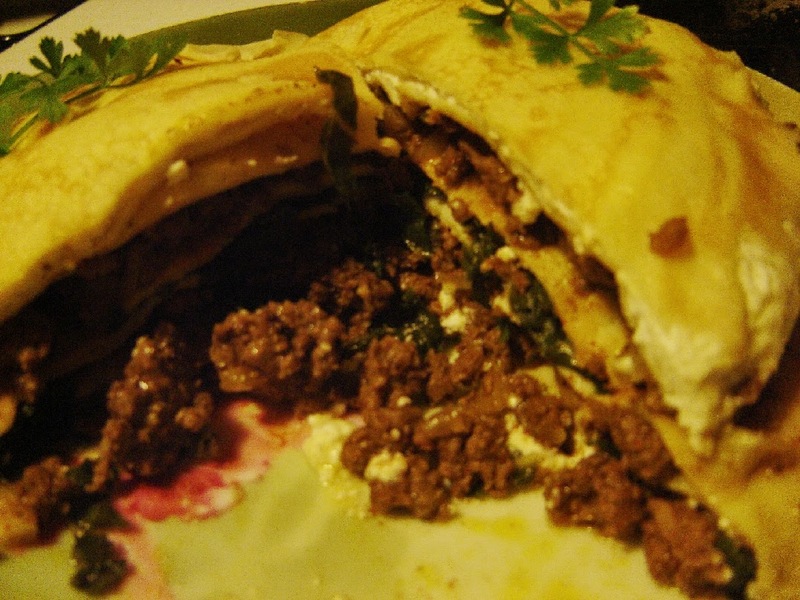 I had plenty to save for another meal, which will be beef cannelloni in the remaining crepes. 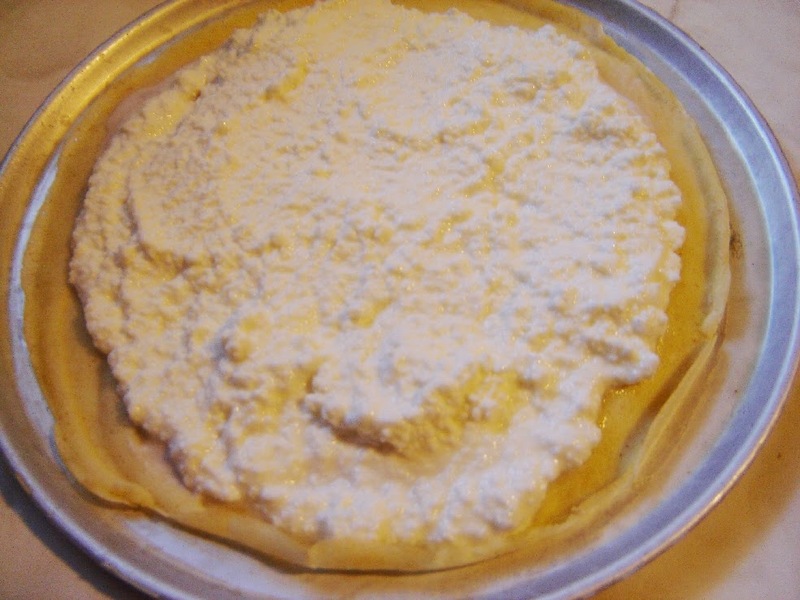 Put your layers together by first brushing coconut cream onto both sides of a crepe. Put it down into your pan, add filling over the top, and continue until you have about 5 or 6 layers. And, just as a side note, coconut milk has been found to contain an abundance of vitamins, minerals and antioxidants, as well as "According to "Ceylon Medical Journal, coconut fats do not contain trans-fatty acids. The fats that are present in coconuts are less likely to clog arteries." So, be healthy and slather it on! If you use ricotta as part or all of the filling, you might sprinkle it with garam masala or cardamom powder. Now brush more coconut cream onto the top and sides of your cake, and bake at 350F until the cake is dry. Mine took about 25 minutes. Let cool slightly and cut into wedges. Serve with a chutney and perhaps a fresh cucumber raita, and you have a delicious meal. 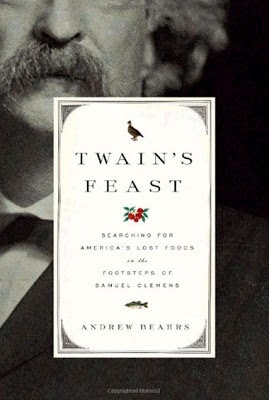 For our bimonthly Cook the Books Club, the current selection was Twain's Feast by Andrew Beahrs, a meandering digression on the travels and favorite American foods of Samuel Clemens, then, and what has become of them now. on the California coast. The damming of the muddy Mississippi and etc. etc. Possibly preaching to the saved here, but lots of fascinating information. I especially enjoyed all the material on possum and raccoon preparation. "Since last spring the literary world has been abuzz about the November 2010 release of the first volume of Mark Twain's autobiography. Twain had left the manuscript with specifications that it not be published until one hundred years after his death, by which time he would be "dead, unaware, and indifferent." In the 1860s, a young Samuel Clemens, who had only recently adopted the pen name of Mark Twain, was one of the first reporters to be sent from the mainland of the United States to the Hawaiian islands. He was on assignment for the Sacramento Union to provide their readers with information about what these fabled islands were really like. Twain spent almost four months in Hawaii, eventually producing for the Sacramento Union 25 letters about the Sandwich Islands, as he called them. His letters were a huge hit at the time, and the merit of his work lives on. One Hawaiian native, Lawrence Downes, writing recently about Hawaii for the New York Times (5-14-06) notes that Twain provides the "best travel writing about Hawaii...that I have ever read." During his visit, Twain traveled to the summit of Kilauea, hiked Diamond Head, and made his way through the valleys of the islands. He also surfed, testing out the sport that locals loved even then. "For me its balmy airs are always blowing, its summer seas flashing in the sun; the pulsing of its surf is in my ear; I can see its garlanded crags, its leaping cascades, its plumy palms drowsing by the shore, its remote summits floating like islands above the cloud-rack; I can feel the spirit of its woody solitudes, I hear the plashing of the brooks; in my nostrils still lives the breath of flowers that perished twenty years ago." But that first trip became a pivotal point for Samuel Clemens, and he was never able to return for a stay. His stories were so popular that his fame began to grow, and he found himself in great demand. Writes Twain: "I returned to California to find myself about the best-known honest man on the Pacific coast. Thomas McGuire [Maguire], proprietor of several theaters, said that now was the time to make my fortune -- strike while the iron was hot -- break into the lecture field!" Around 1860 a number of the Chinese who had left the plantations began to open small businesses in an area of Honolulu known as Chinatown. These businesses were mostly small shops specializing in specific trades such as grocers, jewelers, bakers and tailors, as well as the restaurant trade. 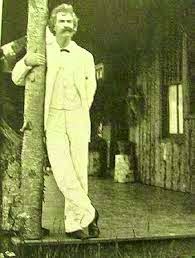 Which brings me to my point - that Sam Clemens would most likely have visited Chinatown during his stay in Honolulu, as he was there in 1866. Chinese food had became wildly popular by that time, with both foreigners and the local Hawaiians, especially dim sum, the varied and delicious appetizers. One variety of which remains a local favorite - Manapua, the Hawaiian word for Char Sui Bao, tasty little buns with a filling of pork char sui. Several years ago I made them for the first time, stating then that I didn't know of anywhere on the Big Island to get any (wanting organic, sustainably raised pork made it a bit difficult of course). For the recipe see my earlier post. However, this time I wanted to use my sourdough starter, more likely what the early manapua makers of Chinatown would have used. A delicious treat, and surprisingly easy to put together. If you slow roast some pork, you might add Chinese seasonings to your left-overs, and have the filling without any trouble. 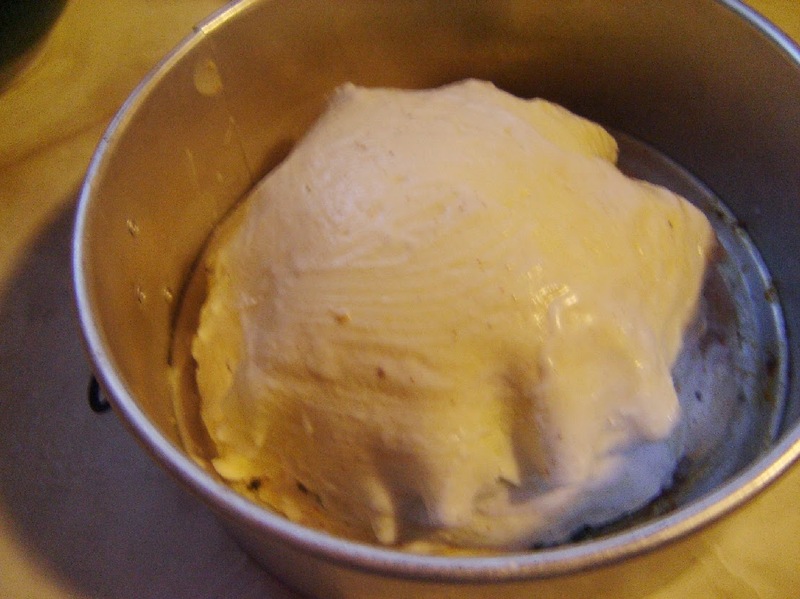 The dough is a cinch to work with, and they can be baked or steamed in a bamboo steamer over a wok, as I did. 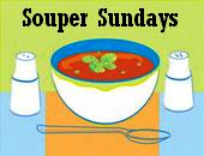 Visit the Cook the Books Club page to check out what everyone came up with later in the week, and to see what books are lined up for the coming months if you would like to participate. 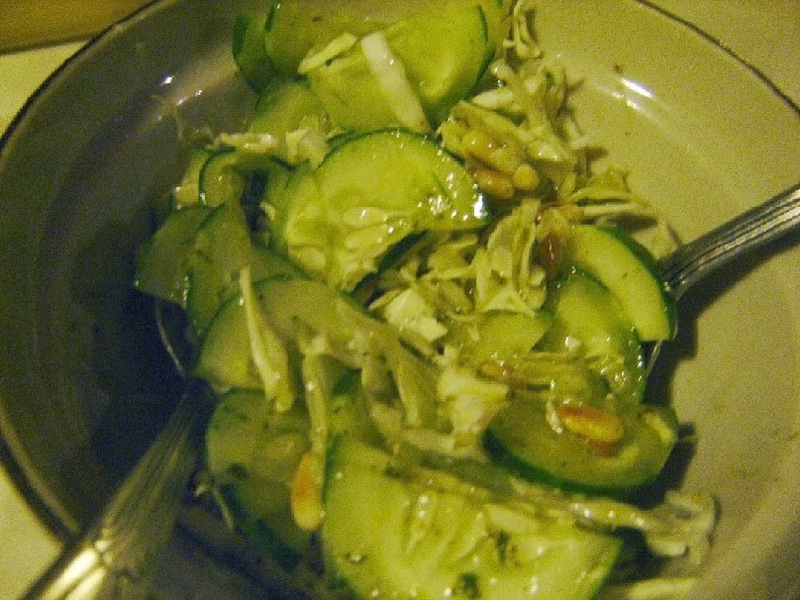 Of course, for those of us who usually make our own dressings this was not really a challenge. So, in order to make it one, I decided to do something that was. Make my own oil for the vinaigrette! Or have someone else do it. 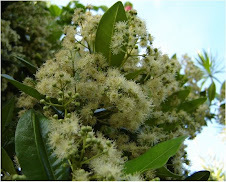 The project and the coconuts have been waiting, but then a friend interfered with that idea and gave us a big jar of his own macadamia nut oil. 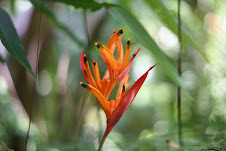 He has an oil expeller, and also has a large grove of coconut palms, and makes coconut oil. An amazing dude, who actually runs his car on that oil. 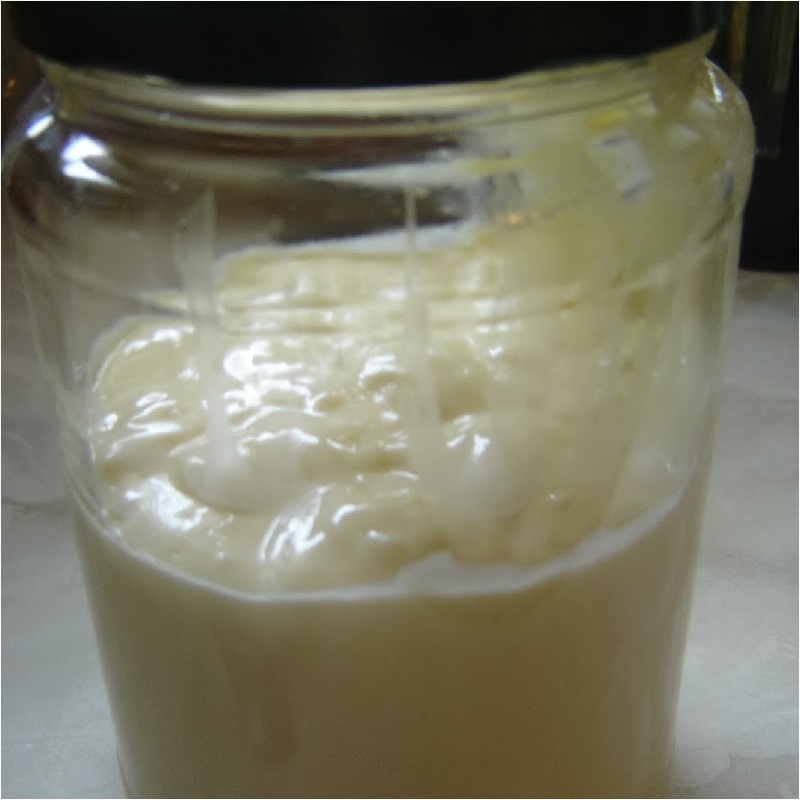 I thought the mac nut oil would be lovely in dressings and an aioli, which I made immediately. I made half the amount of risotto in the given recipe, and there was plenty for the two of us to have it with dinner the first night. I made sautéed Ono, otherwise known as Wahoo, with pesto sauce, and served with the risotto, it was excellent. 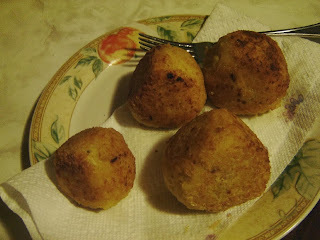 Even after making the Arancine next day, there is still enough to make more tonight. Having made extra when I slow cooked some pork tenderloin Sunday, the filling was a given for these little delicacies. In that pork braise there were also fennel, tomatillos, some lime juice, tomatoes and wine. So I minced all that up good, adding sautéed onion and toasted, ground fennel seed. But, you can follow the directions and make it from ground beef as Manu directs. But, to me this dish is a classic for left-overs. Left-over risotto and stew of any sort for stuffing. 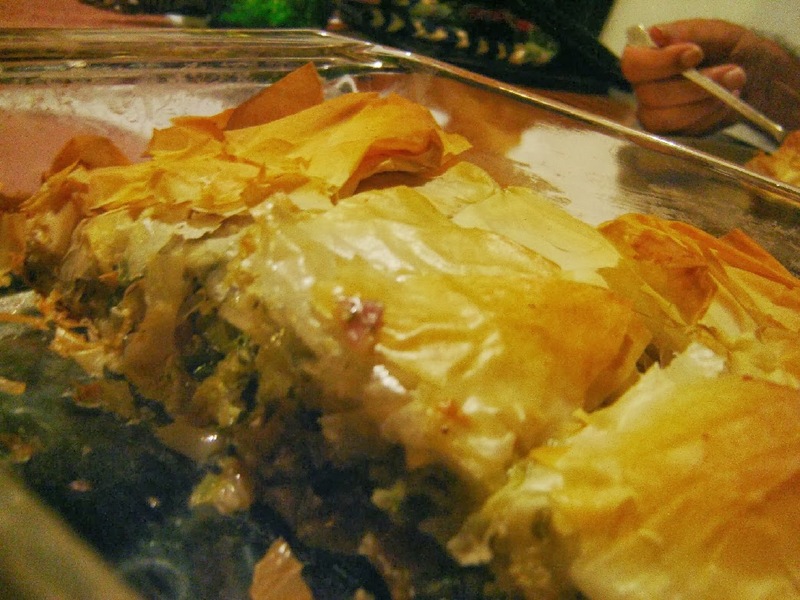 However, she also provided recipes for vegetarian versions. So, left-over spinach maybe, but I am transmitting the recipe for meat Arancine as given. You can get the alternate recipes at the above link. 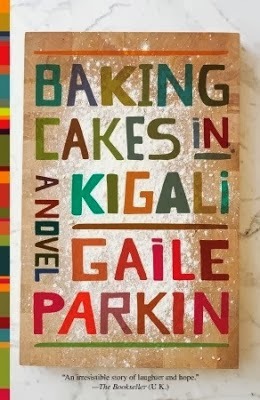 Our current Cook the Books Club selection, Baking Cakes in Kigali, by Gaile Parkin, was a wonderful glimpse of life in a distant land and culture, modern-day Rwanda, albeit in a place (University housing) heavily influenced by Western thinking, customs, food, etc., with a resultant struggle by some of the local people to hang on to African traditions. In spite of all the horrific experiences endured by many of the characters in Parkin's book, an upbeat and hopeful mood was maintained. There was humor and flavorful individuals aplenty, encountered by the heroine, Angel Tungaraza, through her home business of catering special occasion cakes. I thought all the negative references to "white cake" as opposed to the brightly colored frostings on Angel's cakes was particularly funny. Cake itself is not "African", and the bits of recipe we were given certainly had no claim to outstanding taste. Similar to The Cake Boss, TV series. 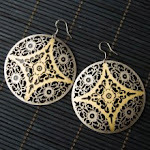 It's all in the design and decoration, rather than any wonderful or distinctive flavor. But that is quite aside from the chef's artistic outlet and entrepreneurial creativity. In case you don't know what's going on here, we read a book selection bimonthly, and then cook something inspired by the work. For my submission, I was tempted to bake three white cakes, with differing flavors. About this time last year I made Black Cake, a West Indian specialty, so why not? One of my very favorites is coconut cake, made with coconut cream and topped with shredded coconut on a fluffy white frosting. Then the Sticky Lemon Cake, which I'd been wanting to make since reading a Nancy Atherton book which included that recipe, Aunt Dimity and the Deep Blue Sea. Perhaps to be followed by a Butter Mochi Cake. However, what I ended up with was the Sticky Lemon Cake and a Blackberry Mochi Cake.